At Kumho Tyres, we believe in going the distance. Which is why our guarantee is designed to give you 80,000kms of ‘no worries’ driving on the Kumho Road Venture APT KL51. That’s the equivalent of driving around Australia 6 times.With our ‘no worries’ guarantee, if your 4wd or suv tyres don’t last as long as they should, you don’t pay for the miles missed. From Tassie to the Top End, Broome to Byron – wherever you go in Oz, you’re covered. Some people call it peace of mind. We just call it our 80,000km tyre guarantee. Introducing the Kumho Tyres Australia Mileage Guarantee for the Kumho Road Venture APT KL51 (80,000km) and the Road Venture SAT KL61 (60,000km) fitted to SUV, RV and 4×4 vehicles. As a global manufacturer of high tech tyre products, Kumho is so confident in its product it will guarantee you a specified mileage result for the Kumho Tyres you have just purchased. serial number as well as the mileage on your vehicle at time of fitment. Keep your mileage service booklet (Kumho recommend you keep the service booklet and original invoice together with the vehicle’s log books). 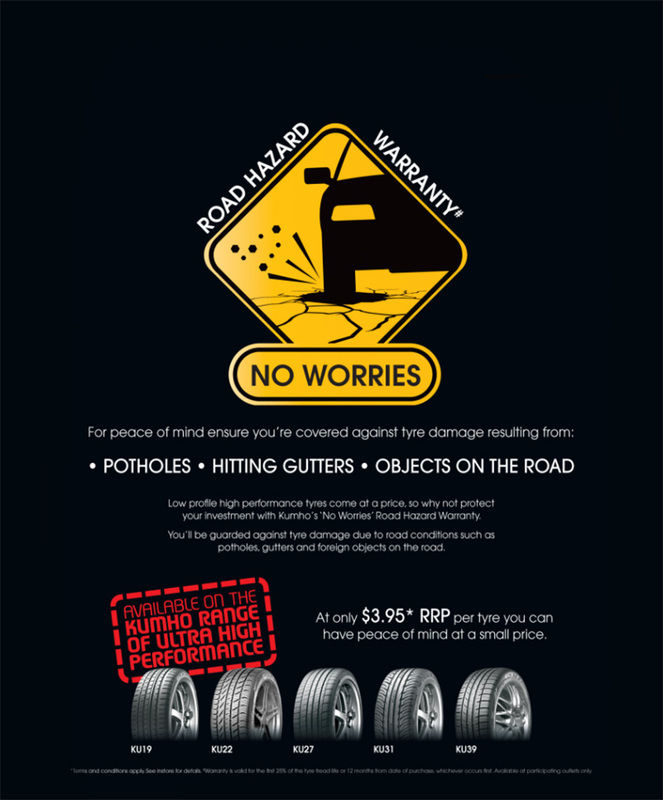 Every 10,000km take your tyres to your Kumho Tyres dealer for a service. Once you achieve the mileage we trust you will be happy to purchase another set of Kumho Tyres. In the event that you did not achieve the guaranteed mileage, return the Kumho Tyres to your Kumho dealer set out in the ‘place of purchase’ section of the service schedule.